If you need an amp to cover a whole host of genres and you're looking to go the digital modelling route, the GT112 should definitely make your shortlist. Range of amp models and effects. Loud enough for gigs. Tremolo and reverb settings aren't as convincing as other effects. No effects loop. 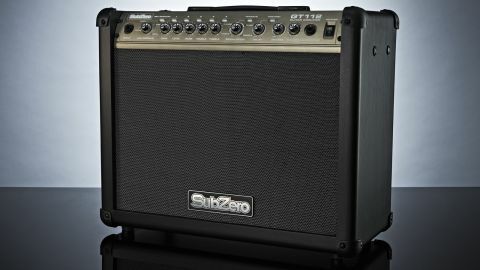 Digital modelling has come a long way - from lines of text on retina-burning LED screens to simple analogue-style operation - and nowhere is this better demonstrated than on the SubZero GT112 60W DSP guitar amp. While its fascia screams spaceship chic, in practice, tweaking the amp's eight models, six effects and five user presets is as straightforward as it comes: 10 knobs, eight buttons. It's a concept that Line 6's Spider series has been evolving over the past couple of decades, but SubZero aims to give it its own cutting-edge spin, boasting "the latest generation in advanced amp and effects modelling technology". So, here's what you get: four amp models - Clean, Tweed, Fuzz and Metal - with two variations each. Your tone is tweaked by the standard three-band EQ set of bass, middle and treble, and effects come courtesy of three sections: modulation, delay and reverb. The modulation dial controls chorus, flanger, phaser and tremolo, while delay and reverb are adjusted via a dedicated knob each. Individual tap tempo buttons allow you to tap in the delay time and modulation rate you desire, too. Once you've crafted your ideal tone, you have five channels in which to save it, essentially creating your own custom amp. These channels can be recalled with the buttons on the amp or by using the optional SubZero RJ45 Dual Footswitch (£27.99), which will come in handy when you take the GT112 on the road. Indeed, gigs are no problem, thanks to the 60 watts the amp pumps out through a custom-designed 12-inch speaker. But this combo is equally at home, well... at home. A headphone output makes it ideal for silent practice, and you also get a line-out for direct connection to recording gear, plus an aux-in for jamming along to your mp3 player. Switch on the GT112 and you're greeted by a row of dazzling blue LEDs, but are the tones as impressive as its appearance? Well, the clean channels are pristine, if a little sterile. Still, the versatile EQ lets you tailor the amp to your guitar, while the second clean variation is like engaging a bright switch, transporting you to twang city with a Strat. Tweed 1 and 2 add a vintage valve-ish character, whether providing a touch of hair, or cranking the gain for dirty blues-rock. Fuzz ups the dirt once more, the first variation giving you retro Tone Bender-esque sounds à la Jimmy Page, while Fuzz 2 is much more modern and cutting - Billy Corgan and Matt Bellamy fans will approve. Finally, we come to the Metal setting. This is the hellish quarter where the largest amount of gain resides. It's as brutal as you'd expect, although boosting the middle control enables you to use the vintage-voiced Metal 1 (think Iron Maiden, Metallica) as a classic-rock tone, too. Meanwhile, for über-scooped Dimebag Darrell riffage, Metal 2 ably delivers the goods with a sledgehammer to the head. The effects don't disappoint, either: the flanger is swooshy, the phaser bouncy and the chorus rich, but the tremolo is a little choppy for our tastes. Fortunately, the delay is a lot of fun, particularly when playing syncopated riffs using tap tempo. This can be a double-edged sword, however, making it tricky to dial in particularly slow or long settings. The reverb, meanwhile, is a little generic, but it's fine for adding a touch of ambience to the sound. Overall, it's an impressive array of tones, ideal for the beginner making their first forays into different guitar genres and sounds. Sure, seasoned guitarists could tell the difference between the GT112's amp models and the real thing, but the ability to recall any of these diverse sounds at will is a pretty mighty proposition, and could prove ideal for the cover band guitarist on a budget. Throw in the impressive effects, solid build quality and gigging potential, and SubZero has a real contender on its hands.